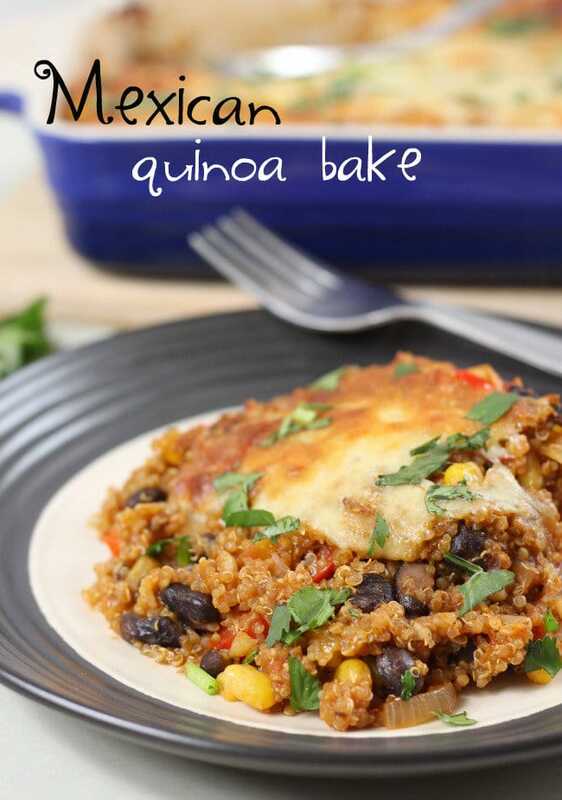 Hands up if you love quinoa! I literally just sighed. That’s the only way to describe this cheesy topping. I used a mixture of cheddar and mozzarella – the cheddar gives a great flavour and crispiness, and the mozzarella gives those stretchy, stringy bits of cheese that make me want to cry in a really good way. 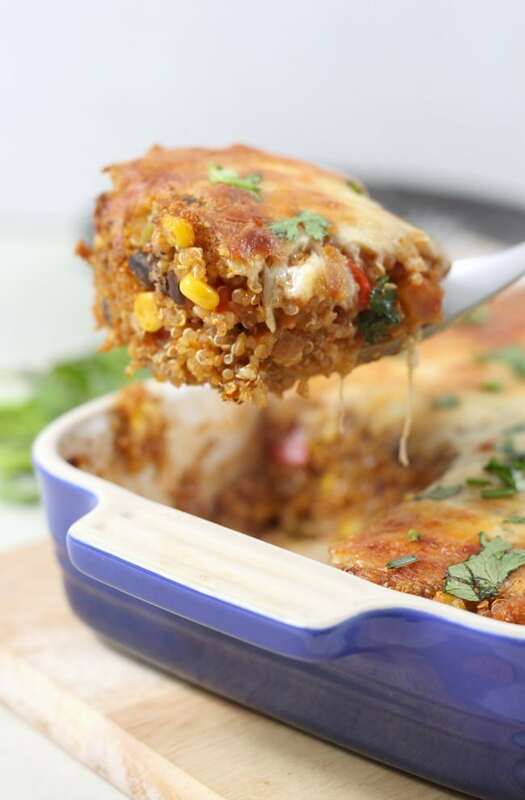 Pair this Mexican quinoa bake with a big pile of salad and maybe a slice or two of garlic bread, and you’ve got the perfect dinner – it’s comfort food, but it’s pretty healthy as far as comfort food goes. You could use brown rice instead of quinoa if you prefer, but personally I think the quinoa is a big part of what makes this dish so amazing. It’s got such a great texture (did I mention fluffy? ), and it’s higher in fibre, protein, and iron. One of the best things about this recipe is that everyone will love it – meat-eaters and veggies alike. Don’t let your carnivorous friends be put off by the quinoa (even if it does sound like something you would eat at a vegan yoga retreat in the Himalayas) – once they taste it they’ll be 100% converted. This recipe first appeared on Great British Chefs. Boil the quinoa in the vegetable stock for around 15 minutes - the quinoa should become soft and the spiral-shaped germ should detach, and the liquid should all be absorbed. If the liquid begins to dry up before the quinoa is ready, just add a dash more water and mix well. When the liquid is nearly gone, you will need to turn the heat down fairly low to prevent the quinoa from sticking to the bottom of the pan. While the quinoa is cooking, heat the oil in a large frying pan, and add the garlic, onion and red pepper. Cook over a medium heat for 5 minutes, until the vegetables are almost soft. 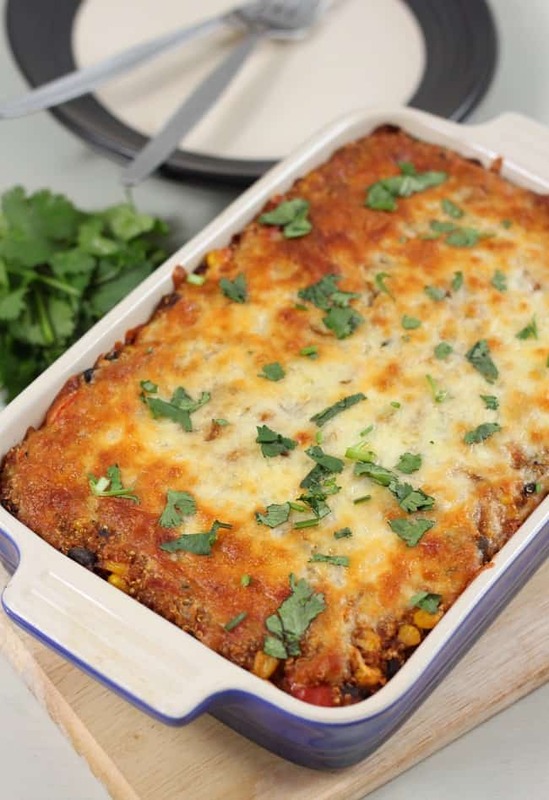 Remove from the heat, and add the spring onions, sweetcorn, drained black beans and fresh coriander. Stir in the enchilada sauce and the cooked quinoa, and then add the spices as necessary (if your sauce was particularly spicy you might decide to skip the additional chilli powder). Season to taste, and mix well to combine. Transfer the mixture to a large baking dish, and sprinkle over the grated cheese. 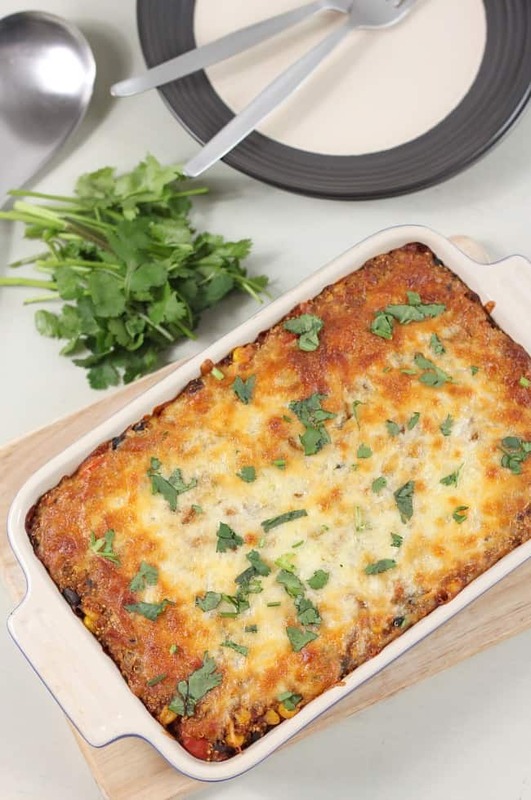 Bake for around 30 minutes, or until the cheese is golden and crispy, and the quinoa mixture is piping hot. 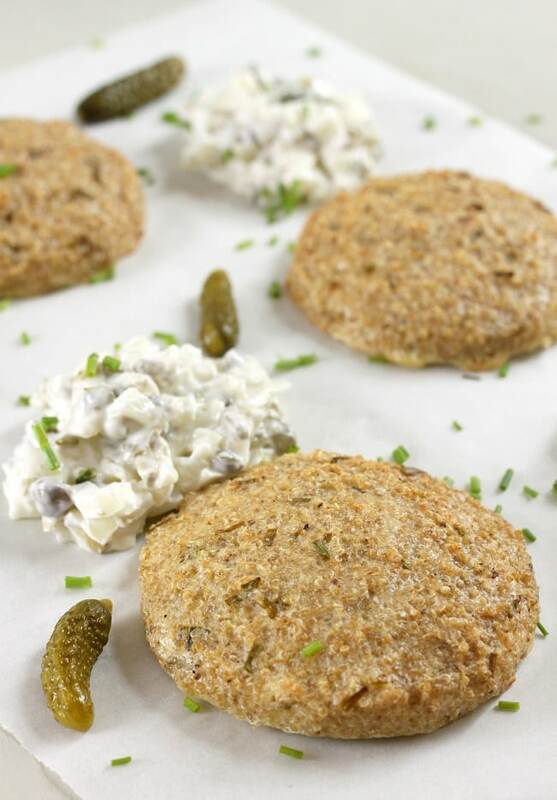 If you have any quinoa left over, make sure you put it to good use in my cheesy quinoa cakes! I’m with Misty. Looks good but if measurements are not given in US standard, I know I’ll end up printing this out but never going to the trouble of looking up equivalents. That’s a shame, but it’s your choice. I make the effort to convert American recipes into standard measurements, it’s not hard. Or you can buy a scale for about $15. :-( Could someone give me measurements in US standards. Cups, etc. This looks so nummy!!! Aw thanks! You should definitely make it, and definitely call it keen-waaaah! Quinoas bubbling away as I type. And YES, glad someone agrees with me on Keen-WAH! Oh my, this looks delicious! My husband is skeptical about quinoa, but he loves Mexican food, so this would be a great recipe to convince him to give it another try. My arms are waving like crazy over here too! 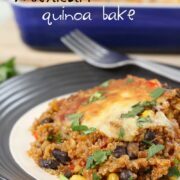 I adore quinoa and am amazed at everything you can do with it. 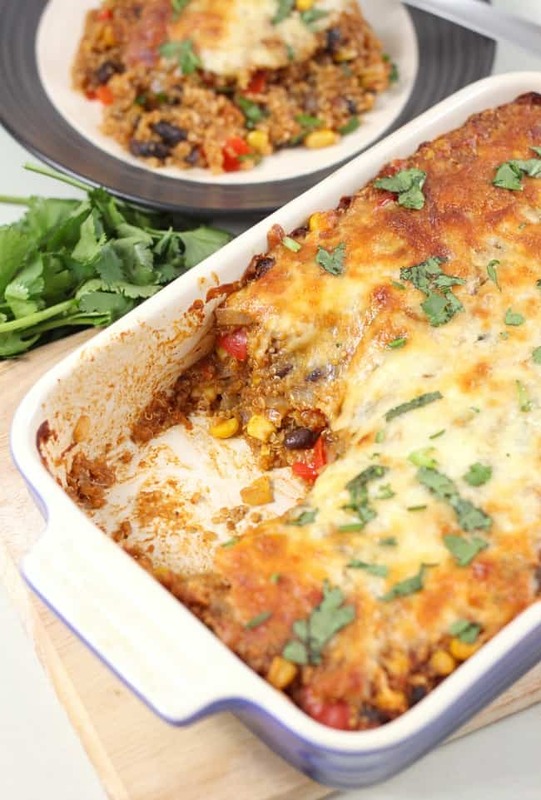 This Mexican bake looks absolutely delicious! What a tasty meal! mmm i love quinoa bakes! i did a broc and cheese one, I need to try this one now too! Mmm…this looks delightful! 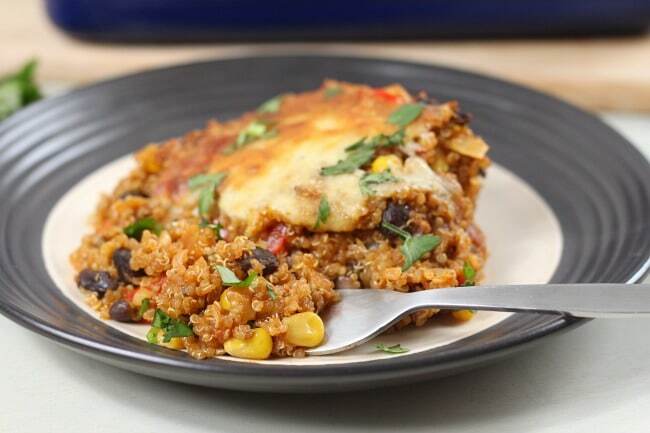 I love Mexican food, but I don’t love how I usually feel really weighted down by it afterward, so this looks perfect, with the fluffy yet filling quinoa. Thanks for sharing the recipe!